The Feelfree Gemini is one of our most popular Double Sit on tops, featured packed and easy to use, it is a great choice for family's. The Feelfree Gemini Sport is a versatile and user friendly tandem sit on top which is ideal for family use, couples or friends. 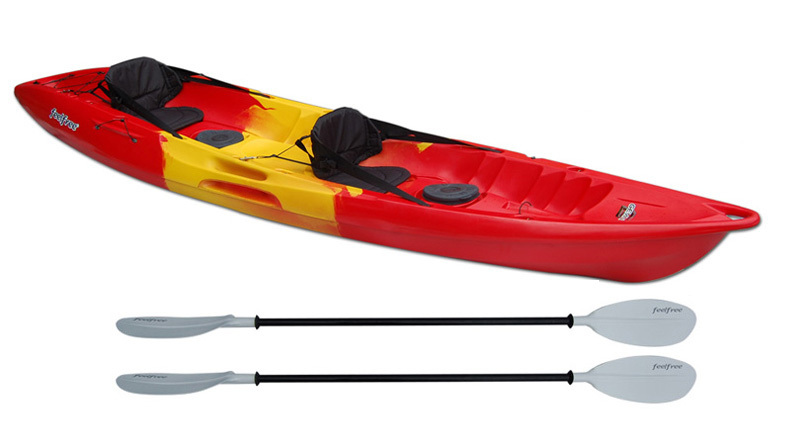 It also has the option of being paddled solo using the centre seating position of the boat. The Gemini is very stable thanks to its wide hull shape, but is also fast and tracks well thanks to its tri hull shape and long keel line. It also has a wheel built into this keel to help with moving it to and from the water on hard surfaces. The Gemini is perfect to use as a platform to fish from (with the option of two flush mounted rod holders), to go snorkeling or swimming from or just for exploring. Two small 8" hatches are situated between the legs of both paddlers to keep those essentials safe (Always use a dry bag aswell). At the stern you have a storage well for your trolley or a dry bag and it also has recessed areas to fit two flush mounted rod holders. 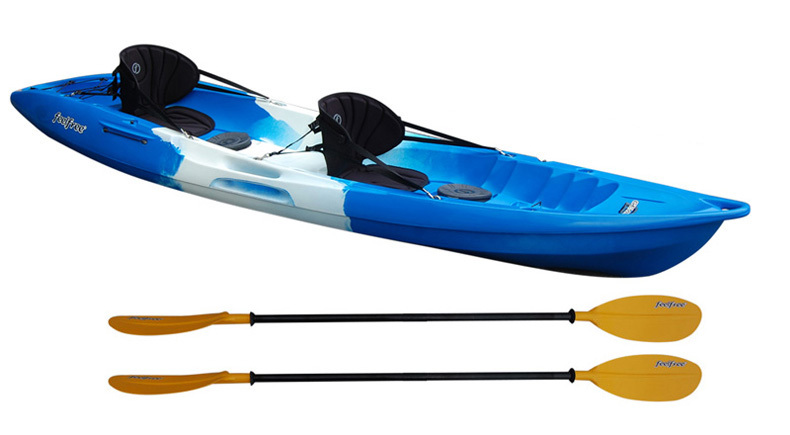 The Gemini also features moulded in side grab handles which help with moving the kayak around, loading it on and off a roofrack, and also for getting back on board after swimming or capsizing. The Feelfree Gemini does not come with seats as standard, we would recommend them for extra comfort and support and there are two options for the Feelfree Kayaks. The Canvas seats (as shown in the picture above) are adequate for most people whilst the deluxe seats give more comfort, and extra support thanks to a more rigid back pad. We often have limited edition colours in stock, please contact us on current availablility. A paddle leash secures the paddle to the kayak to stop it drifting away if you capsize or drop the paddle. Hard wearing alloy shafted paddle with plastic blades that is ideal for sit on top kayaks and recreational touring kayaks. 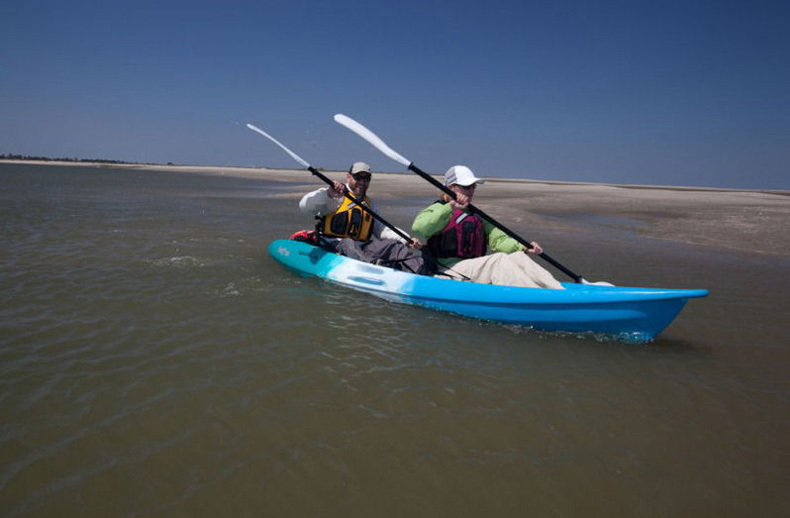 Make you paddling trips more comfortable with a padded backrest. The Feelfree Canvas seat offers increased back support and features a rear pocket. Comfortable padded seat that provides plenty of back support for a comfortable ride. Made from quality material that maintains its shape. Made from a tough PVC material and with a roll down top you will get a great dry bag that will keep your belongings safe and dry whilst kayaking. If you are local to our shop in Hamworthy, Poole then we may be able to deliver a Feelfree Gemini Sport with one of our own vehicles. For boats, this is free to most BH Postcodes - please call us on 01202 625256 to discuss your requirements. Buy a Feelfree Gemini Sport online from our website and collect from our shop in Hamworthy, Poole or you can collect from any branch within the Canoe Shops Group. There is no cost associated with instore collection.